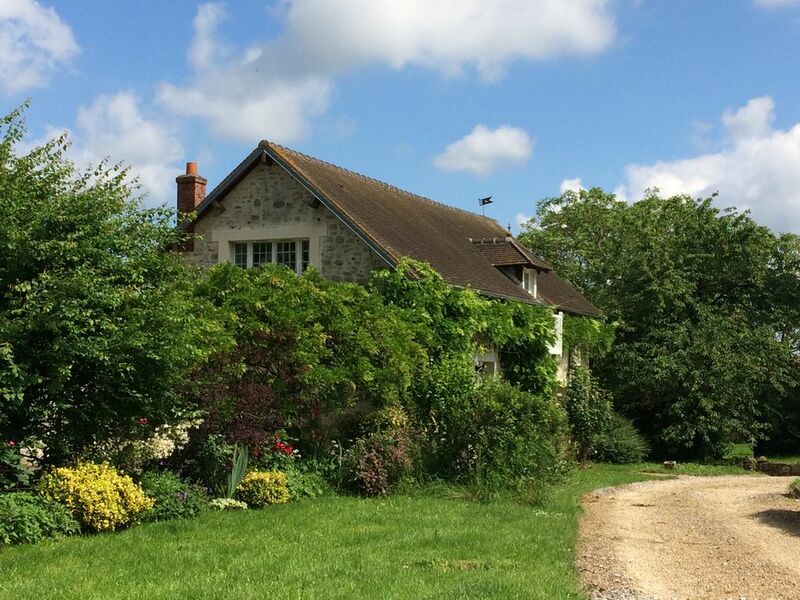 The "Gamekeeper's Cottage" is close to Roissy (Charles de Gaulle airport) and Senlis and is ideally situated for those who wish to visit Disneyland, Parc Astérix, Compiègne, Chantilly, La Mer de Sable and is only a 45 minute drive from Paris. It is also handy for the Raray, Apremont and Chantilly golf courses. Easily accessible from the A1 motorway. Attractive cottage (140m2), recently renovated, with two large bedrooms. The cottage is situated on the edge of a quiet hamlet in the courtyard of a 17th century hunting lodge. Please not that the only channels available are English - speaking. For those who prefer Paris by train, there is a regular and direct train service from Crépy-en-Valois (10 mins from the house) to Paris (Gare du Nord). The journey time is 35 minutes and there is ample free parking at the station. Lovely rustic cottage. Very welcoming host. Well equipped kitchen with all appliances required. Comfortable beds and good bathroom facilities. We visited Parc Asterix and Senlis which had good restaurants and facilities. About an hours drive to Disneyland Paris. Would like to have stayed longer. Prompt refund of deposit. Thank you Henrietta. When we arrived at the cottage (late due to flight delays) we were immediately greeted by Henrietta who let us in and showed us around. The cottage was ideal for our family of 4, beds were made on our arrival and the towels were ready for use. The grounds surrounding the cottage were colourful and pretty. We were around an hour from Disneyland (by car) and 10-15 mins (by car) from the local train station which took us directly into Paris which took around 35-40 minutes. Ideally located as we don't mind travelling on a train or in a car. The cottage was warm due to the summer weather but the large windows aided the flow of air through the property. The bathroom was fantastic, one of my children prefer a bath the other a shower - once the bath was ready both my boys could bath/shower at the same time due to the shower being separate. I had to contact Henrietta during the week due to an issue with the hot water, but this was easily sorted as she gave me directions over the phone of how to put the hot water heater on. Thank you Henrietta for a lovely stay at your Gamekeepers Cottage, we enjoyed staying with you and we could well be back in the future! Beautiful property, plenty of room in very peaceful rural location. Property has everything required for a comfortable stay. Would personally advise a car is required, there are two towns within an easy 15 minute drive. One of the towns (Crepy en Valois) has a train station with a direct route to Paris in 35 mins. The other is very picturesque, perfect for dinner or coffee. There are also plenty of other attractions or things to do within a 40min drive. Wir verbrachten eine sehr erholsame Woche in diesem wunderbar ruhig gelegenen und perfekt ausgestatteten Ferienhaus. Die sehr freundlichen Vermieter wohnen direkt gegenüber und sprechen auch sehr gut englisch. Bis auf das wlan, welches nicht wirklich funktionierte (was uns aber nicht störte), war im Hause alles vorhanden, sauber und in Ordnung. Ausflug nach Paris ist mit dem Zug von Crepy en Valois (10 min mit dem Auto vom Ferienhaus bis zum Bahnhof) problemlos und schnell möglich. Auch sonst zahlreiche attraktive Ziele in der Nähe (Vaux le Vicomte, Ermenonville, Chantilly). Wir können dieses Ferienhaus nur uneingeschränkt weiter empfehlen. Avons découvert une charmante maison tout équipée jusque dans les moindres détails. Henrietta s'est montrée une propriétaire discrète mais vraiment accueillante et disponible. Endroit très calme, pour se détendre et respirer tout en se sentant comme chez soi! For weekend bookings there is a minimum of 2 night stay. However guests may arrive from midday on day 1 and stay until 6pm on day 3. For 3 or 4 day weekends (bank holidays etc) please check that this is possible prior to reservation. A fold-up baby bed and small child's bed are available on request as are babysitters. No animals please!